January 12, 2017 will mark fifty-two years since Lorraine Vivian Hansberry (1930-1965) died at the age of thirty-four after a long battle with intestinal cancer. Her masterpiece A Raisin In The Sun and the Broadway play of the same name, broke new ground in America for African-American playwrights. In fact, her play was the first by an African-American woman to have a run on Broadway. The story of the Younger family has been played out in cities all over the country as people have desired to leave their own communities in search of a better quality of life. The book remains her most popular work but just who was the real Lorraine Hansberry? In this biography, Patricia and Fredrick McKissack tell the story of the playwright’s life from start to finish. And what we see is the formation of the one of the most gifted Americans to have ever lived. Tupac Shakur had always mentioned Hansberry as one of his idols. The same applies for the myself. Her tragic death at such a young age, is one literature’s and society’s greatest losses. She was born into a family of descendants of slaves on both sides but grew up in a very affluent household. Educated in schools of high prestige and was surrounded by family members committed to excellence who instilled in her from a young age, a commitment to excellence and other traits that remained with her through life as she becomes a playwright and spokeswoman for the growing movement to eradicate Jim Crow and obtain civil rights for all people in the United States. The Lorraine we come to know as we read through the book, is one who is not afraid to break new ground, challenge social norms and express her thoughts. She remains disturbed by racial prejudice, war and poverty. Writing becomes her outlet and as a result, she produced classic works that have stood the test of time. Her personal life in many ways, made as much of a statement as her works of fiction. She was present at the now famous meeting with then Attorney General Robert F. Kennedy, in which she and several other activists made their case for civil rights heard. Kennedy came away from the meeting browbeaten but in just a few short years, he would become a candidate for President of the United States and a leading icon of the movement to reshape America through a liberal lens. Her marriage to Robert Nemiroff was a social taboo at the time and illegal in some states. She smoked cigarettes, supported the gay cause, wore long pants and even challenged Malcolm X on his views against interracial marriage during his tenure under the Nation of Islam. Reportedly, the two became friends later on. Never one to be controlled, she lived her life on her own terms and at her own pace. And even as she was dying from terminal cancer, she continued with her work while focusing on the many issues that continued to plague Black Americans. Her vivacious personality, sharp mind and literary skill, earned her the respect, admiration and friendship of an endless list of writers, actors, government officials and activists. Today I often wonder what would she think if she were alive today, about the current state of America. I think she would ask us if we have learned anything from A Raisin In The Sun. More than fifty-seven years later, America still struggles with acceptance of those of us that come from different countries, speak different languages, eat different foods and worship different gods. We have come a long way since Hansberry’s time and are decades past the inhumane system of Jim Crow. However, we still have a long path in front of us where much work is needed. If she were here with us, she would encourage us to continue to make our voices heard in opposition to injustices afflicted upon anyone of any background. As A Raisin in the Sun continues to be re-made for film, television and Broadway, Hansberry lives on in immortality with her words continuing to remind us of the importance of self-reflection and the struggles we all face. 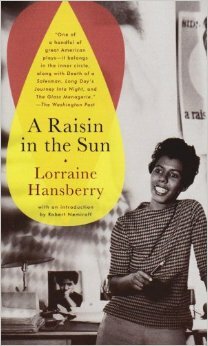 I highly recommend that anyone who is a fan of Lorraine Hansberry read this biography of her life. She and her family were quite unique in many ways but Lorraine by far was the standout. As a person who loves literature, it would have been a pleasure to just sit and talk with her about a range of topics. Reading through her material, I have become acquainted with a voice that touches deep inside human emotion forcing us to confront the very things we wish did not exist. Had she lived, I believe her career would have reached new heights and Broadway would have been in her debt. This is the life of Lorraine Vivian Hansberry. In March, 2014, I had the privilege of seeing Denzel Washington on Broadway when he starred in a new production of Lorraine Hansberry’s ‘A Raisin In the Sun’. Hansberry’s classic play has graced the Broadway stage repeatedly throughout the years and even caught the eye of Hollywood being adapted to movie and television formats. When she wrote the play, I don’t know if she knew then that it would go on to become a classic, but I do believe that she was fully aware that her play would have an impact on American society and the never-ending issue with race. The play is set in a time where segregation and racial discrimination were highly prevalent throughout the United States. We are introduced to a small American family struggling to live the American dream. Living in a small apartment as a typical nuclear family, Walter Lee, Ruth, Travis and Lena, represent the social status of millions of African-Americans at the time. The death of Lena’s husband results in a life insurance payout and the family now is faced with the question of what to do with the settlement. While Walter Lee has his own idea, Mama has her own plan, one that will test every member of the family. Her vision to buy a house in predominantly white neighborhood is the crux of the play and the most intense. The visit by Mr. Lindner on behalf of the resident’s association highlights the discrimination and fear that gripped suburban communities as minorities attempted to leave the turmoil of the inner city during the middle of the 20th century. Although the issue of the house is critical to the development of the play, the characters we meet are equally just as important. Through them we are able to re-evaluate our own thoughts on marriage, religion, parent-child relationships and the relationships we have with our friends. Hansberry’s masterpiece continues to open eyes and hearts and is a crucial piece of literature that ranks high among the works of all celebrated authors. The true tragedy is that she didn’t live to see the legacy her play developed following her death. Had she lived, I think she would be amazed at how far America has come since the Youngers dared to challenge social norms and make a case for integration on their own. And she would never hesitate to remind that it’s okay to sit awhile and think. “Never be afraid to sit awhile and think.” Those words, made famous in Lorraine Hansberry’s ‘A Raisin In The Sun’ have often reminded me of the importance of reflection when life shows signs of difficulty. Her groundbreaking play became the first show on Broadway to be written by an African-American woman and with multiple runs on Broadway and a feature film starring the legendary Sidney Poitier, it is one of the most recognized books from that era. This is Lorraine in her own words, revealing her thoughts about life, the future and the world in which she lived. Born and raised during the era of Jim Crow, she relays her thoughts about the United States and the struggle around the world by people of color for equality and civil rights. James Baldwin provides a short introduction for his friend and fellow author. 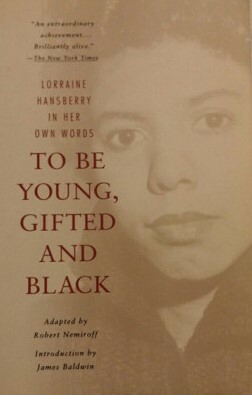 The book was published following Lorraine’s death. Her ex-husband, Robert Nemiroff, collected her unfinished manuscripts and written notes, combining them into this book that explores her mind and character. Hansberry once said that the very thing that makes you exceptional also makes you lonely. Similar to Baldwin, Hemingway and many of the great authors, there seems to be an inner struggle for peace and emotional well-being. She loves America but hates its actions. Her husband is white in a time when interracial marriage is illegal in parts of the country. And it is hoped that the next work can improve on the success of ‘A Raisin in the Sun’. Her life is a composite of many things but tragically her time was running out. She died before she could finish many of her projects but the short passages from the writings she left behind show a developing mind on a path to even highly levels. She has been gone for 51 years but her name continues to surface in conversation, media, film and on Broadway, the place were she became famous. And while this book is not Raisin, it is a welcomed addition to the Hansberry collection.